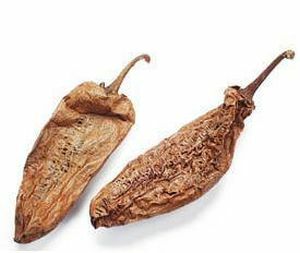 Chipotle, or chilpotle, which comes from the Nahuatl word chilpoctli meaning "smoked chili" is a smoke-dried jalapeño. It is a chili used primarily in Mexican and Mexican-inspired cuisines, such as Mexican-American and Tex-Mex. Varieties of jalapeño vary in size and heat. In Mexico, the jalapeño is also known as the cuaresmeño and gordo. Until recently, chipotles were largely found in the markets of central and southern Mexico. As Mexican food became more popular abroad, especially in the United States and Canada, jalapeño production and processing began to expand into northern Mexico to serve the southwestern United States, and eventually processing occurred in the United States and other places such as China. Its heat is similar to that of the Espelette pepper, jalapeño, Guajillo chili, Hungarian wax pepper, New Mexican varieties of the Anaheim pepper, and Tabasco sauce. Chipotles, often a key ingredient, impart a relatively mild but earthy spiciness to many dishes in Mexican cuisine. The chilis are used to make various salsas. Chipotle can be ground and combined with other spices to make a meat marinade, adobo. Chipotles have heat and a distinctive smoky flavor. The flesh is thick, so the chiles are usually used in a slow-cooked dish rather than raw. Whole chipotles are added to soups, stews or in the braising liquid for meats. They can also accompany beans or lentils. Most of the health benefits of chipotle are attributed to its vitamin, minerals, and other nutritive content, including capsaicin, iron, magnesium, phosphorous, and dietary fiber, as well as vitamin A, K, C, B6, and potassium. Cancer Prevention: Certain chemicals that are present in chipotle have been shown to significantly reduce the chances of cancer, particularly prostate, lung, and pancreatic cancers. More research is currently being done on the effects of capsaicin and chili peppers on other types of cancer. Cardiovascular disease: Chipotle peppers have also been positively linked to a reduction in cardiovascular diseases like atherosclerosis, heart attacks, and strokes. They reduce the presence of cholesterol and triglycerides, both of which can lead to dangerous and life-threatening conditions. It also helps the body dissolve fibrin, a naturally occurring substance that helps to form blood clots, which are the major cause of heart attacks and strokes. Diabetes management and prevention: Adding chipotle, and more importantly, capsaicin, to your diet can help you reduce many of the dangerous conditions and situations associated with diabetes. Weight loss: Recent studies have shown that adding capsaicin-rich food, like chipotle peppers, to your diet can greatly help your weight loss efforts. Metabolism and energy expenditure: In addition to long-term weight loss, capsaicin found in chipotle and jalapeno peppers also increases postprandial metabolism. Anti-inflammatory activity: Although people naturally associate hot peppers like chipotle with heat and inflammation, they actually exhibit anti-inflammatory properties, both internally and externally. Respiratory conditions: It can help relieve those irritating conditions stuffy nose or a sinus headache. Capsaicin remains the most powerful element in this process, and induces mucus secretion, which can empty out the airways and sinuses, and also remove the irritants or bacteria that might be causing the respiratory or sinus condition in the first place. Immune system health: Chipotle is a rich source of vitamin-C, like many fruits and vegetables, and this natural antioxidant can help to scavenge free radicals from the body and reduce your chances of contracting a number of diseases and condition, including cancer and heart disease. Digestion: Chili peppers like chipotle have a high fiber content, which can greatly benefit your digestive system. Bone health: As a great source of calcium and magnesium, chipotle peppers offer strong prevention of bone deterioration by stimulating growth and repair. Night blindness: High levels of vitamin-A can be found in jalapeno peppers and chipotles, and this essential nutrient has a long history of increasing eye health, slowing down the appearance of cataracts, and reducing macular degeneration. Wound healing: Potassium is another essential nutrient found in high quantities in chipotle peppers. It also speeds up the healing of wounds and growths and reduces the appearance of scars. Furthermore, potassium is a necessary component for the body to uptake calcium, thereby aiding in the development of bone matter for growth and repair, as well as the prevention of osteoporosis.